I really could have used MLB.com’s new At Bat application for the iPhone this weekend. Our seats for the Cardinals-Astros games Friday and Sunday weren’t bad, all things considered, but we were in the outfield underneath an overhang from the deck above us at Minute Maid Park. We could not see the gigantic scoreboard, which is essential for real-time game information and knowing what the heck is going on. To help us keep up with player names, positions, averages, and all the other stats generated by baseball, I turned to a Web-based application for the iPhone called Sports Tap. It’s a wonderfully simple app that tracks games and events in the sporting world from baseball, basketball, football and hockey to NASCAR, and Formula 1 racing. It’s sort of a mobile SportsCenter without the ESPN branding. I tapped on St. Louis at Houston and was taken to a scoring summary, or boxscore. The user interface was a bit primitive — I had to go to separate pages to view St. Louis or Houston player statistics, and there was no wiki-like link between the two for easy navigation, but overall I could keep up with lineup changes and statistics. MLB.com, the interactive arm of Major League Baseball, has substantially improved on Sports Tap by not only offering real time scores and statistics but also video highlights, which amazingly are available moments after a play like Lance Berkman’s towering 460-foot home run on Sunday. Not only would At Bat be handy in the stadium, but think about all the times when you want to follow your team in the March Madness college basketball tournament or the NBA Finals and you’re stuck shopping with the wife and kid or going out to dinner when you’d rather be at home in front of the TV. 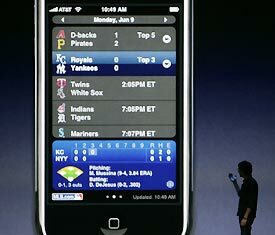 At Bat, which will be available when the App Store launches in July, gives you a seat at the ballpark or at the mall. We just hope that other sports leagues will follow MLB.com and make their own iPhone applications.